Introduction and Objective: Laparoscopic nephrectomy has become the standard of care in the academic and community setting alike. Few studies address the length-of -stay in the community setting. We describe the initial experience of a board certified general surgeon performing laparoscopic nephrectomy on a short-stay (24-hour) basis with a board certified urologist. Materials and Methods: A retrospective review and analysis of 40 consecutive laparoscopic nephrectomies for both malignant and benign conditions was performed from 2002 to 2008. Neither the general surgeon, nor the urologist had formal fellowship training in laparoscopic nephrectomies. Results: Forty patients underwent a laparoscopic radical nephrectomy from 2002 to 2008, mean age 65 years, (range 30 to 87 years). Thirty two cases were for malignancy. Average estimated blood loss was 155 cc. The median length of stay was 1 day. Twenty eight patients (70%) were discharged in less than twenty-four hours. Nine patients were discharged on the second postoperative day and two patients where discharged on the third postoperative day. One patient developed a retroperitoneal hematoma secondary to anticoagulation therapy. The patient was discharged on postoperative day four and recovered without sequela. As the surgeons’ experience increased the length-of-stay decreased, with 11 of the last 14 patients discharged home within twenty-four hours. No patients required readmission. 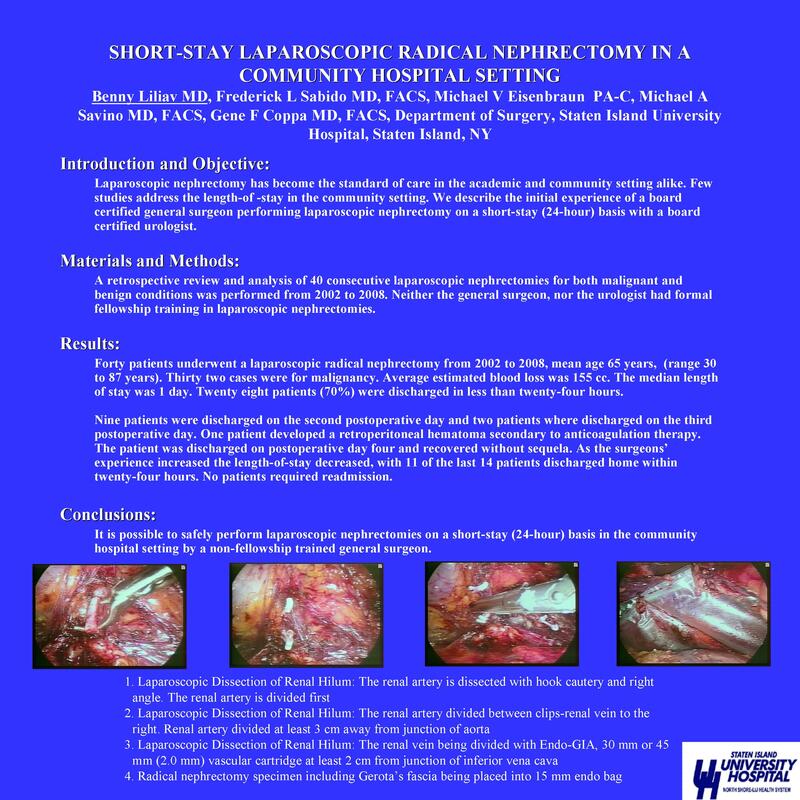 Conclusions: It is possible to safely perform laparoscopic nephrectomies on a short-stay (24-hour) basis in the community hospital setting by a non-fellowship trained general surgeon.